What makes up a Cosyfeet shoe? 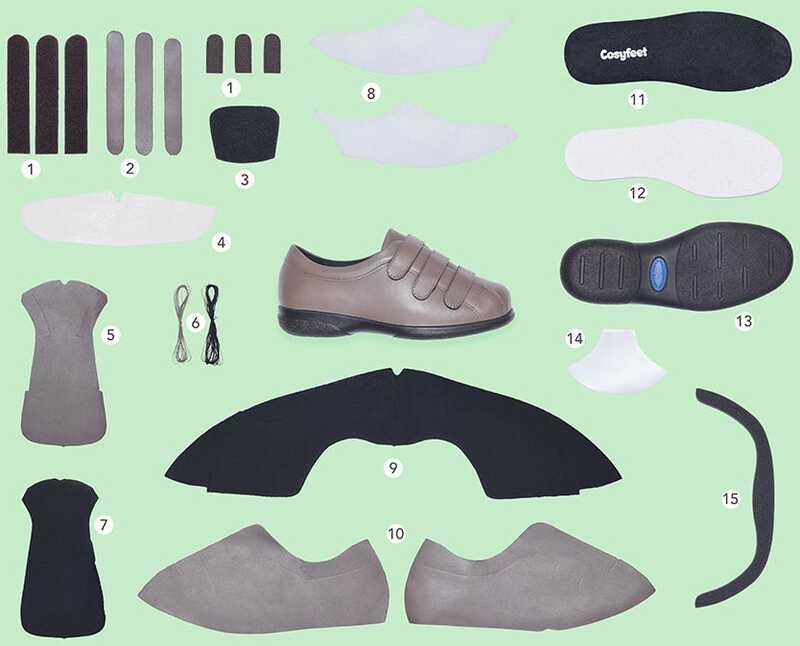 Have you ever wondered how many parts make up a Cosyfeet shoe? We’ve deconstructed our Alison style to show you all the hidden details that make up this ultra-comfy shoe. 1: Touch-fastening for straps & 2: straps - used to fasten the shoe and provide adjustment to help accommodate various foot shapes and sizes. 3: Tongue Foam - soft padding in the tongue for extra comfort across the instep. 4: Counter Stiffener - reinforced woven material laminated between the upper and lining which when moulded into shape helps provide a secure fit around the ankle. 5: Vamp - leather upper piece covering the toe area. 6: Thread - Strong nylon or cotton threads used in sewing the shoe pieces together. 7: Vamp Lining - sanitised (toe area) woven and cushioned lining allows your feet to breathe. 9: Quarter Lining - sanitised (inside and outside of the foot) woven and cushioned lining allows your feet to breathe. 10: Quarter - leather upper pieces used on the inside and outside of the foot. 11: Footbed - cushioned comfort underfoot layer adds shock absorption and stability to the foot and ankle. Removing it will provide extra depth for orthotics if required. 12: Insole - this is the ‘backbone’ of the shoe, to which the upper and sole are glued together. 13: Sole Unit - polyurethane sole, which is lightweight, shock absorbing, flexible and extremely durable. 14: Toe Puff - reinforcement material laminate between the upper and lining at the toe which helps to maintain the toe shape and provide protection for sensitive toes. 15: Collar Foam - Soft padding around the top of the shoe for cushioned comfort around the ankle.